Don’t forget about our weekly rides and trail work! The Shenandoah Valley Bicycle Coalition sponsors many annual events for the cycling community. These are fun, family-friendly events with activities for cyclists of all ages. Listed below are events sponsored by SVBC as well as some of the other fun, local events that are not sponsored by SVBC. Trail Work – Scheduled regularly throughout the year, dedicated volunteer trail maintenance crews venture out into the woods to keep the trails riding smooth and fast, and to build exciting new trails. SVBC trail work crews are responsible for volunteering thousands of hours of service on the trails, and the results of their work can be seen throughout the national forest, as well as on the western slope of Massanutten and right in Harrisonburg at Hillandale Park. Social ride – approx 2 hrs – route determined by weather conditions) Most folks will be on road bikes but all bikes are welcome. Questions? Contact Marcia at 540-432-3312 or mamphier [at] harrisonburg.k12.va.us. Event information also posted on SVBC’s facebook page. 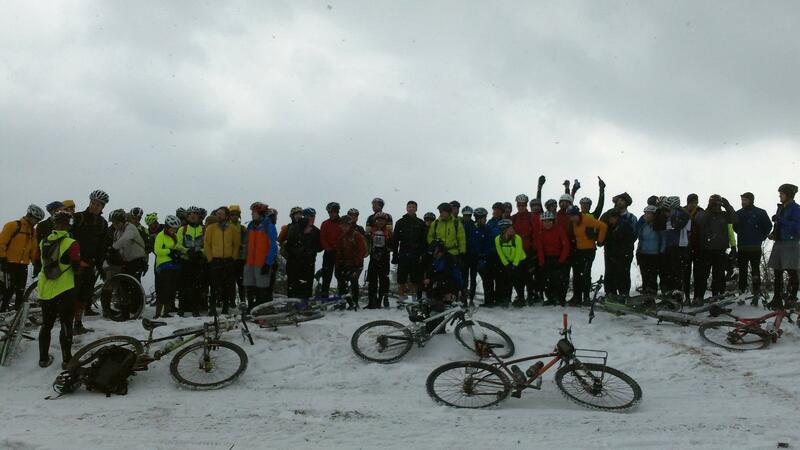 Check out our 2013 ride picture and our 2012 photo gallery. This is a chilly, sometimes just downright cold, annual group ride that takes place every year on the day of “The Big Game”, also known as the “Super Bowl.” Before settling down to watch two teams battle over the pigskin, join your fellow cyclists for a winter climb to the top of Flagpole Knob (highest point in Rockingham Co.), and then descend back down on one of many exciting trails or roads. Not an SVBC-sponsored event. Harris-Roubaix – Sunday April 12, 2015 at high noon (always at noon the same day as the European Spring Classic, the Paris-Roubaix). The annual Harris-Roubaix is a casual group ride from Court Square, Harrisonburg to a family farm about 7 miles North of Harrisonburg, from the farm there will be a 10-15 mile loop marked for your enjoyment. You are more then welcome to ride the loop once or more, there is a informal 3 lap race that will crown the Champion of the Harris-Roubaix. Event information also posted on SVBC’s facebook page. For the last five years, the Shenandoah Valley Bicycle Coalition has been giving back to mother earth by picking up trash in our precious George Washington National Forest on Earth Day. Meet 8:15 am at Mr. J’s on 42 South or 9 am at Dog Grave Yard on Tillman Road. (But come anytime-we’ll be there till noon, and we’ll make sure to save some trash just for you.) Questions? Contact Marshall Hammond at marshall_hammond [at] merck.com. Event information also posted on SVBC’s facebook page. May is National Bike Month and Harrisonburg area is an active participant! Events are organized by the community for the community and open to families and folks of all ages. Activities range from community bike rides, scavenger hunts, rules of the road workshops, bike themed hoedown and much much more. Bike To Work Day is Friday, May 15th, 2015. Ride your bike to work that day and/or organize your business to hop onto their bikes that day too! This year, the DR100 is the Saturday before the Ride of Silence. Choose between two great route options, both through breathtaking mountain and pastoral scenery: a Metric Century, approximately 68 miles (with 5,593 feet of climbing) and a Half Metric Century, approximately 30.2 miles (with 2,323 feet of climbing). For more information on the ride and the great work of the DR100, see www.dr100.org, or visit them on Facebook. Join cyclists worldwide in a silent slow-paced ride (max. 12 mph/20 kph) in honor of those who have been injured or killed while cycling on public roadways. The ride is completely silent.The ride starts at 7pm. Start location in Harrisonburg to be announced. Questions? Contact Marshall Hammond at marshall_hammond [at] merck.com. The annual Virginia Mountain Bike Trail Festival is Memorial Day weekend in Stokesville, VA–this year for a glorious four days! This event is organized by Shenandoah Mountain Touring. Cross Country, XXC, Short Track and Super D! A unique event that is a mix of cross country and downhill racing. The Massanutten course includes a little bit of everything: tight, twisty, rocky technical ridge riding and finishes with high speed smooth trail that include rollers, rhythm sections, berms, and some pedaling. You end up 1500 feet lower when you are finished with an expected winning time of 9 minutes. Note, while this is not an SVBC-sponsored event, part of the proceeds are donated to SVBC, SVBC members receive a discount at registration, and volunteer hours at the HOO-HA! will count toward your Massanutten trail pass. Contact [email protected] if you’re interested in volunteering. A grueling multi-day mountain and road bike stage race. Held the first week of July each year, this event combines the most challenging trails and roads that the central valley has to offer. Who will take home the prestigious yellow jersey, or the coveted DFL title? Brought to you by Our Community Place (OCP). The Annual Shenandoah Valley Bicycle Festival offers a variety of scenic rides for both the beginner and the more experienced rider. Ride options include 25 miles, 50 miles and a 100-mile “Century Ride” over the rolling roads of the beautiful Shenandoah Valley. The rides start and finish at Our Community Place at 17 E. Johnson Street in Harrisonburg, Virginia, and all proceeds go to support OCP’s programs, which help folks facing difficult life circumstances and those seeking recovery from addiction. Come on out for the annual Ice Cream Ride! A casual road ride leaving from Kline’s on Wolfe Street in Harrisonburg. We’ll ride for approximately two hours with a stop for ice cream at the finish of the ride. Contact: Neups (540) 438-1488 or Marcia (540) 432-3312. Invitational in November. Not an SVBC-sponsored event. A valley tradition for over 30 years, with ride options for 25, 50, and 100 or more miles, the Shenandoah Valley Century is the finest way to tour the scenic and historic Shenandoah Valley. Scenic vistas, small towns, beautiful farms, quiet roads, and more. All routes are paved and have low traffic volume. Participants ride at their own pace; the event is not a race. Maps are provided and the route will be patrolled by automobile sag to provide assistance as needed. A food and drink stop is provided every 25 miles and at the midpoint of the 25-mile ride. The Annual Tour & Taste bike fundraiser gives riders the choice of 50, 25 and 15 mile ride options. Each ride will start and finish at Three Brothers Brewing in Harrisonburg. All tasters will receive a beer of their choosing at Three Brothers. All tickets include a catered lunch, tech t-shirt and live music! All proceeds go to benefit the Valley AIDS Network! The goal of Harrisonburg & Rockingham Bike-Walk Summits is to develop partnerships and to increase coordination between the City, County, and other stakeholders to make our region a great biking and walking community to live in and visit! Jeremiah Bishop’s Alpine Loop Gran Fondo provides the opportunity and inspiration for individuals and teams to take on great challenges in support of worthy causes. Beyond operating expenses, all proceeds from the event will directly benefit the local community.The Alpine Loop Gran Fondo will further organize support for its charitable causes through additional donations, Spirito di Squadra fundraising teams, raffles, silent auctions of donated merchandise, and the gala event in Downtown Harrisonburg more info. Continues every Tuesday through the end of October. The Friendly City Grand Prix will hold all events in Harrisonburg! You heard it right. No more driving over the mountain to fight the Foof. No more driving deep into the breadbasket of the Confederacy to show Queen City who is boss. Now you can come out to Ramblewood Park on Tuesday September 18 at 5:30pm and play cross with all of your best friends. Afterwards we will find someone’s house to go and hang out. Tell your friends, tell your neighbors!Cross is back in Harrisonburg and it isn’t going over the mountain this time (We hope Queen City and Fooftown will still show up to play with us…)The dates are set, every Tuesday night through the end of October. Hillandale Park – This is our second time pairing up with the city to do this fantastic event to get kids on bikes and to get them exposed to the local trails. Volunteers needed. Call Marty at 560-2776 if you an help out a couple hours. Kids time trial to follow at 12:00pm. Prizes for all that attempt. This annual gathering in Stokesville, VA has been ongoing on since 1997. Three days of riding, two nights of camping, delicious meals, and plenty of fun. There are scheduled group rides throughout the weekend, gear swaps, kids and family rides, demo bike, and access to many of the best trails in the area for your own adventures. The showing of the prior year-in-pictures has become an annual Festival tradition.